Belladonna has done it again! 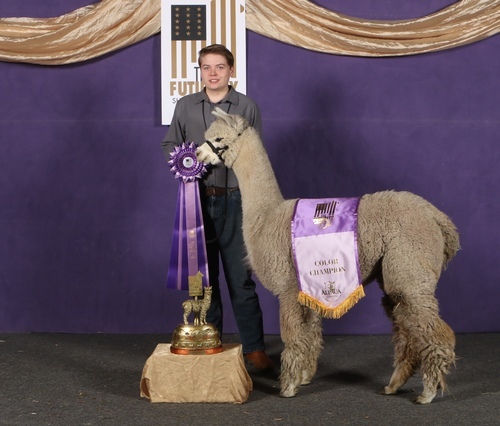 Her 2018 cria Glamour Girl "Gigi" is a stunning beauty that captures the hearts and attention of ranch and website visitors. 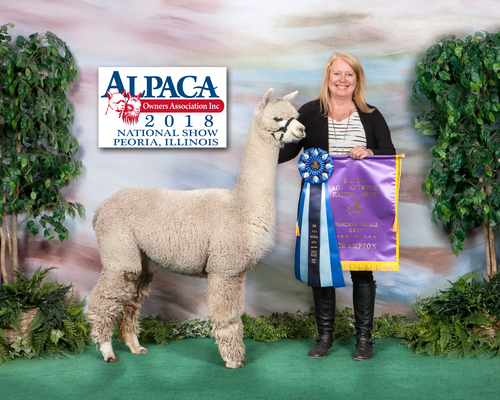 Undefeated color champion at every show in 2018 going up against some of the stiffest competition in the country, she has definitely earned her "Diva" status although she is really a great big love! Fab as we call her, was Fabulous since the day she was born. 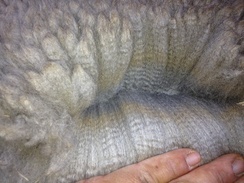 She has the most beautiful lavender hued fleece we have ever seen and is incredible dense and tightly bundled. She has a high frequency crimp style and a very lovely consistent hand. She has spot on conformation in every way and with the exception of her 1 brown spot, she has a super consistent color throughout her entire fleece. 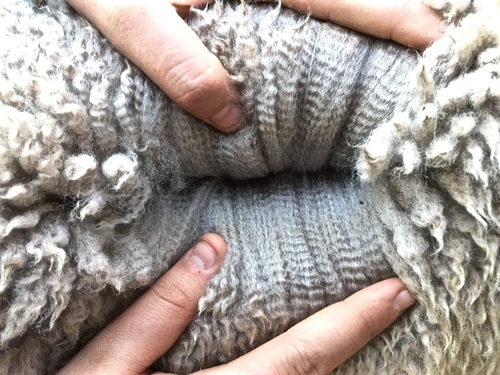 Her fiber is currently being processed into yarn, and it is lovely! 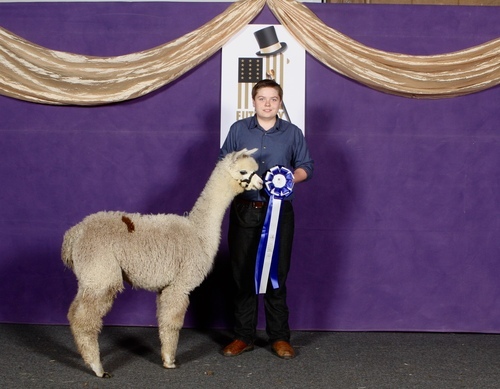 Fab is certainly no fluke, as she was bred to be a star. 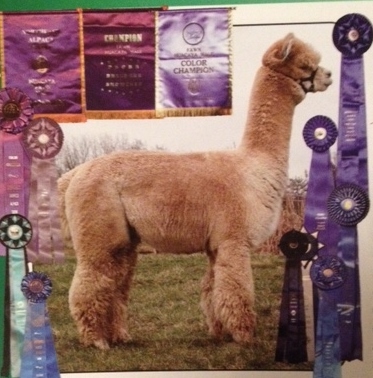 Fab's dam, sired by 17 x banner winner RR Gun's Kit Carson was on our radar from the moment we saw her. 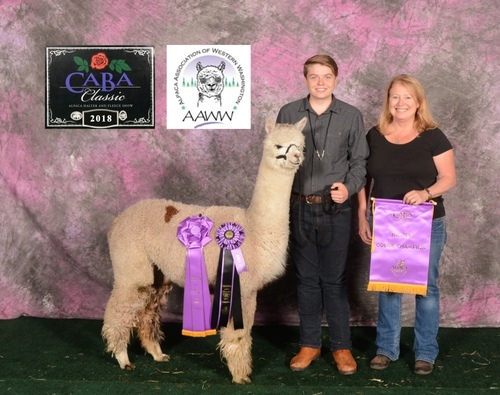 We were able to purchase her as a yearling with the intention of sending her across the country for a very special pairing with A Paca Fun's Ridiculous. Ridiculous is sired by the famous maker of champions Patagonia's Lennox. Lennox has sired over 277 offspring with very few being gray which makes Ridiculous quite special. There is always a risk in sending them so far away for breeding and hoping you get what you ordered. We could not be more pleased with this outcome! 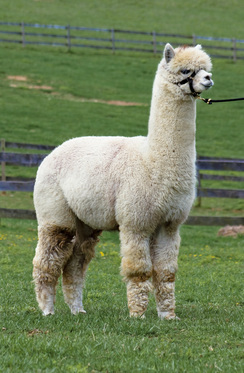 She is expecting a 2019 cria!